Only 15 minutes to make these crunchy, creamy, juicy mini berry tartlets. No pastry dough needed! Mini desserts taste better, right? I love all the mini dessert, you guys! 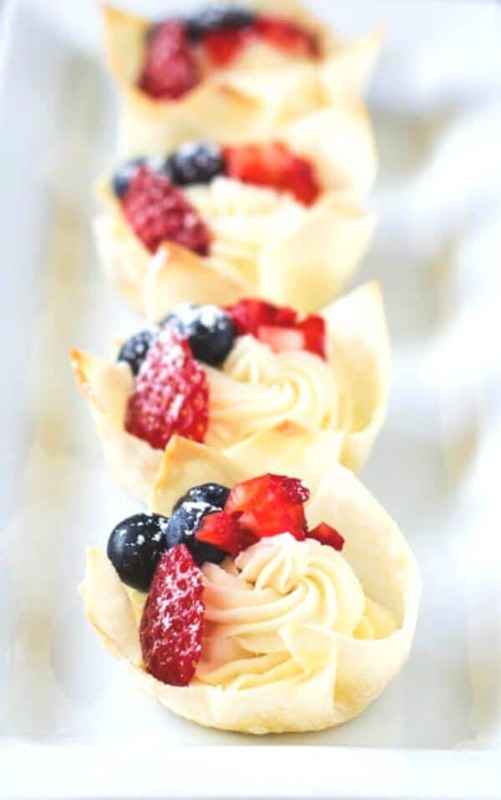 And these effortless, yet elegant mini berry tartlets are going to be a hit where ever you bring them to! All the colors, all the creaminess, all the cuteness, everything about these are amazing. And the best part, you don’t have to slave in the kitchen. Let me show you how to make these treats under 15 minutes! We’re using wonton wrappers instead of pastry dough for these tartlets. I know, when you’re in time crunch, last thing you want to do is to mess with pastry dough. 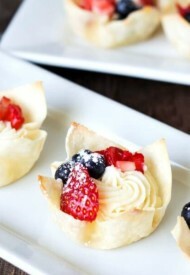 Besides, wonton cups add nice crunch to these creamy tartlets, and fresh berries burst with juicy freshness! That’s it! Can it be any easier? Probably not. I promise it tastes absolutely delicious! 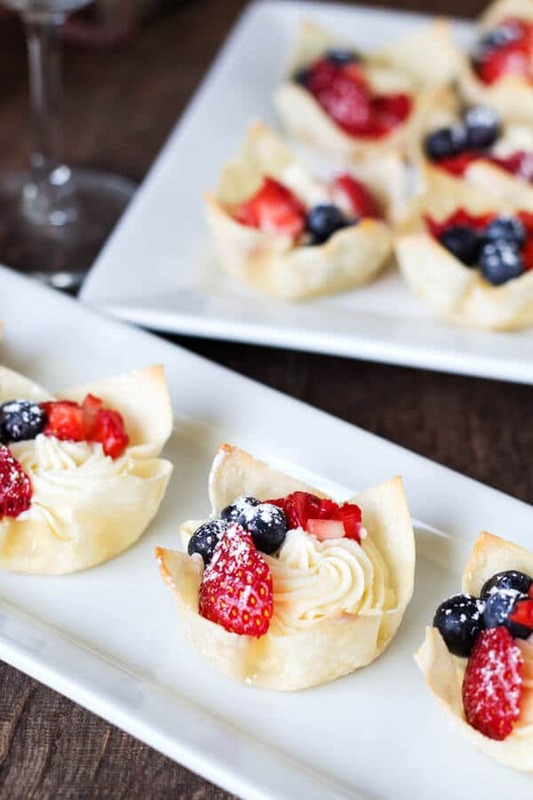 These crunchy, creamy, juicy mini berry tartlets are super easy to make. No pastry dough needed! Place the wonton wrappers in muffin tin. 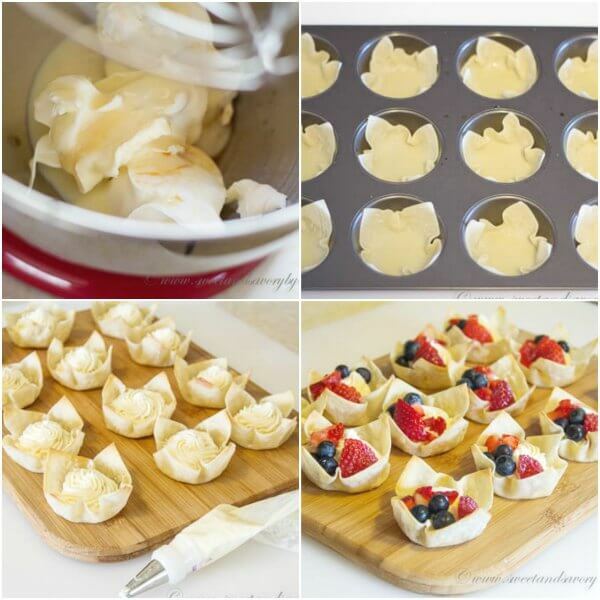 Lightly brush melted butter in the bottom of each wonton cups. Bake them for 7-8 minutes. In mixing bowl with whisk attachment, mix together, mascarpone cheese, condensed milk, vanilla extract and salt until smooth. Once the wonton cups are baked, cool them slightly. Transfer the cheese filling mixture into a pastry bag, and pipe it into the wonton cups. Place the berries on top of the filling. Dust some powdered sugar, if desired. The marscapone cheese was directly out of the fridge when I used it; though it was in there a few days since I bought it, so the next time I try it again, I’ll be sure to use fresh marscapone to see how it’ll turn out. I’ll let you know the results I try it again. Thanks! Mine curdled too. Everything was at room temperature. Hmm, that’s interesting, Keely. I’m clueless what could cause this issue. I never had this issue before. I have access to only one brand of mascarpone cheese, and I can’t test it with different brand. Looks beautiful! I did try it though and had the same problem as Denise. My marscarpone cheese was curd-like so I mixed it a bit to make it creamier before mixing everything else in together. It had a beautiful consistency until I added the condensed milk, vanilla extract, and salt. It became too liquid-y and I was unable to pipe them into the wonton wrappers. Did I over-mix you think? I’ll try it without too much of the condensed milk next time, but I’m afraid it’ll affect the sweetness. What do you think went wrong? Hi, Jo! Sorry to hear that you had a problem too. Quick question. Was the mascarpone cheese at room temperature before you added condensed milk? That would be my best guess of what might have gone wrong. 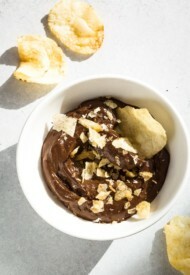 When the ingredients are not at the same temperature, the mixture tends to curdle. Hope this helps. Let me know if you try again. I attempted these twice and both times the mascarpone had a curd like consistency. The flavor was there but it was quite grainy like rice pudding. Did this happen to you? I followed instructions completely and I am not sure what I’m doing incorrectly. Please help. Hi, Denise! Hmm, that’s weird. Any chance the mixture being over-beaten? Maybe next time try hand mixing? Or maybe try another brand of mascarpone cheese? I never had curdled look, so I have no clue what might be an issue. I love to cook like you! I’m glad you liked it, Diane! Thanks! I have not used this cheese before. Is it easy to find? Can I use a regular mixer to blend the cheese with the other ingredients? If I can make this work, I’ll be using them at a school fundraiser on Saturday. Thank you! Hi- Was looking forward to these! I’m making the filling the night before. My filling is fairly liquid – does not come out like the picture? I’m confident I measured correctly. Will is firm up after refrigeration? Any suggestions? Hmm, that’s interesting. I wonder why it would be liquid, there is really no ingredient to make the filling liquid. Was your mascarpone cheese thick? Oh my goodness this looks so delicious and fresh! I love it! Hi Shinee! I’m visiting from Whimsy Wednesday. Seems like I keep finding my way to your blog at link parties! I guess I really like your thumbnails and posts! These look really yummy. I love making little tarts with premade phyllo and puff pastry, but I never thought of wonton wrappers! Great idea! I love this! Adorable little things like these are always a huge hit at get togethers! I can’t wait to try them! I just had to pin these. They are so pretty and it looks really simple to make. I’m going to try them for my daughters birthday party. Stopping by from Wine’d down Wednesday. Awesome, thank you, for sharing, Mariet! These look super yummy! I am pinning these for my next party! Dropping in from Totally Terrific Tuesday! Good luck with your new direction for your blog! Hope you are having a great week! These look so good. I’d never though about using wonton wrappers for dessert cups. I’ll have to try these out. Quick, easy & YUMMY!!! Many thanks for linking with Share It Link Party!!! These look amazing! I’d replace the strawberries since I’m allergic but I can’t wait to try these this summer! I cannot wait to try these!!! 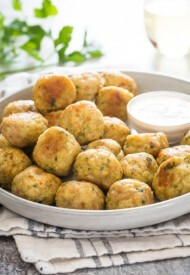 I love anything miniature and bite sized, especially for entertaining or pitch in lunches at work!! Thank you for sharing this recipe, it looks simple and divine!! Hi! I’m back again, visiting from the Sunday Showcase link party. So yummy looking! Beautiful photos! Thanks for sharing! These are beautiful, Shinee! Thanks for linking up at Best of the Weekend! Of course! Your party is always fun! Thanks, Amy! what a gorgeous spring or summer dessert! I need some dessert recipes and this looks delicious and simple!! Renee, they are quite simple, yet delicious. Thank you! These look SO good! I was wondering what to do with the leftover mascarpone in my fridge and now I have the perfect use! Thank you for your help! I ended up using mini cupcake pans… My wontons were small so it all worked out. I doubled the creme ingredients as well. Yay! That’s great to hear, Bee. Thank you for stopping by to let me know. It made my day. These are for the MINI cupcake pans, yes? These are made in regular cupcake pans, not mini. You can make both the cups and the filling today and just store them separately. Cups can be stored at room temperature, but the filling should be refrigerated. Berries will need to be sliced and prepared the day of serving. You can assemble them about 2 hours prior to serving. It should be fine, but if stored longer than 2 hours, I’m afraid the cups might get soggy. You can keep them at room temperature for 2 hours before serving. Hope everyone will enjoy. Let me know and good luck! would frozen fruit be ok for the topping? Jodi, I think the fresh fruits will look better, as they will hold their shape better. The frozen ones will probably need to be thawed and they will not look as beautiful. Why my wonton wrappers are not baking evenly. Some are stays half baked and it’s not perfectly crunchy when u put it in your mouth. Any advise? Hmm, that’s interesting. Did you notice if half baked ones are all on one side of the pan? If so, maybe rotating the pan half way through baking will help. Also, you can remove the fully baked ones first and then bake the rest a little longer. Hope this helps. Thanks for trying my recipe, Chinu.